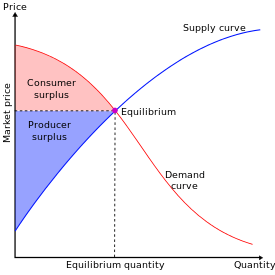 This article is about consumers' and producers' surplus. For information about other surpluses, see Surplus. An engineer named Jules Dupuit came up with the concept of economic surplus, but it was the economist Alfred Marshall who gave the concept its fame in the steam of economics. Consumer surplus is the difference between the maximum price a consumer is willing to pay and the actual price they do pay. If a consumer would be willing to pay more than the current asking price, then they are getting more benefit from the purchased product than they initially paid. An example of a good with generally high consumer surplus is drinking water. People would pay very high prices for drinking water, as they need it to survive. The difference in the price that they would pay, if they had to, and the amount that they pay now is their consumer surplus. Note that the utility of the first few liters of drinking water is very high (as it prevents death), so the first few litres would likely have more consumer surplus than subsequent liters. The maximum amount a consumer would be willing to pay for a given quantity of a good is the sum of the maximum price they would pay for the first unit, the (lower) maximum price they would be willing to pay for the second unit, etc. Typically these prices are decreasing; they are given by the individual demand curve. For a given price the consumer buys the amount for which the consumer surplus is highest, where consumer surplus is the sum, over all units, of the excess of the maximum willingness to pay over the equilibrium (market) price. The consumer's surplus is highest at the largest number of units for which, even for the last unit, the maximum willingness to pay is not below the market price. The aggregate consumers' surplus is the sum of the consumer's surplus for all individual consumers. This can be represented graphically as shown in the above graph of the market demand and supply curves. where This shows that if we see a rise in the equilibrium price and a fall in the equilibrium quantity, then consumer surplus falls. When supply of a good expands, the price falls (assuming the demand curve is downward sloping) and consumer surplus increases. This benefits two groups of people: consumers who were already willing to buy at the initial price benefit from a price reduction, and they may buy more and receive even more consumer surplus; and additional consumers who were unwilling to buy at the initial price will buy at the new price and also receive some consumer surplus. P0 and P1 are, respectively, the prices before and after a change in supply. 2.Microeconomic Theory, A mathematical Approach,Third Edition, James M.Henderson and Richard E.Quandt.